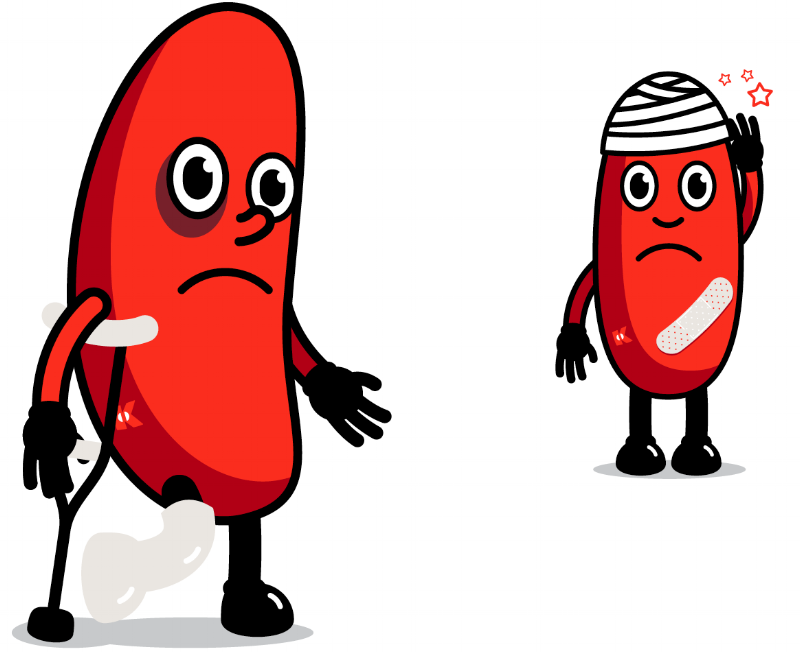 Acute kidney injury (AKI) has been a concern for many years and the teaching has been that contrast can increase the risk of acute kidney injury. Recent literature has addressed this issue and this month’s journal club offers a synopsis of these articles. 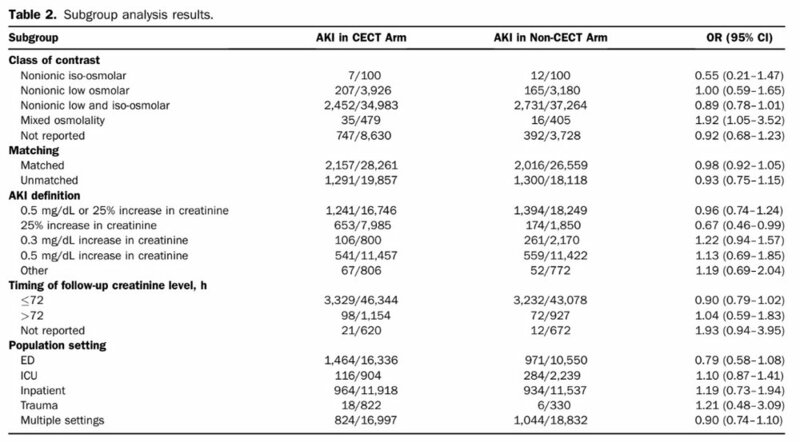 This single-center retrospective cohort study in a large urban academic ED sought to identify the incidence of acute kidney injury attributable to IV contrast by testing the hypothesis that AKI occurs at higher rates in patients undergoing contrast CT than in those not receiving contrast. They compared patients > 18 years who received a CT with or without contrast in the emergency department (ED) that had an initial serum creatinine measured in the eight hours before CT and a second level measured 48 to 72 hours after CT. To minimize imaging decision bias, they included a second control group of unexposed ED patients who did not undergo CT imaging and also had an initial serum creatinine level measured in the ED and 48 to 72 hours later. Secondary outcomes included a new diagnosis of chronic kidney disease, dialysis and renal transplant within six months of first hospitalization. Logistic regression modeling and between groups odds ratios with and without propensity-score matching were used to test for an independent association between contrast administration and primary and secondary outcomes. They had 17,934 ED visits for patients who underwent contrast-enhanced, unenhanced, or no CT during the study period. Rates of acute kidney injury were similar among all groups. The similarity in probability of AKI was found in all subgroup analyses regardless of baseline renal function and whether comparisons were made directly or after propensity matching. Contrast administration was not associated with increased incidence of chronic kidney disease, dialysis, or renal transplant at six months. Clinicians were less likely to prescribe contrast to patients with decreased renal function and more likely to prescribe intravenous fluids if contrast was administered. Factors associated with an increased risk of AKI were increased age, administration of nephrotoxic medication(s), preexisting diagnosis of congestive heart failure or chronic kidney disease, and hypoalbuminemia. Bottom line: Rates of AKI in this study were not higher in those patients receiving contrast-enhanced CT than in those receiving non-contrast CT and in those not receiving a CT. Renal protective measures such as not giving contrast to those with lower glomerular filtration rates and giving normal saline after contrast may have contributed to the lower rate of AKI in this population. Although limited as a single-center retrospective study, in those patients for whom there are no risk factors for AKI, the incidence may be lower than historically suggested. The actual incidence of contrast-associated AKI is reported variably in the literature. In this study, the authors sought to estimate the burden of AKI among patients receiving contrast, as compared with patients with similar comorbidity and severity of illness who did not receive contrast during a hospitalization. Using the Nationwide Inpatient Sample (NIS) data set for 2009, almost six million hospitalizations met the inclusion criteria of age >18 ears old with a less than 10 day length of stay. They compared those who got contrast-enhanced CT with those that did not. Patients were first stratified according to the presence or absence of twelve relatively common diagnoses associated with AKI and evaluated the rate of AKI between the groups. Next, a logistic regression model was used to control for comorbidity and acuity of illness to estimate the risk of contrast-associated AKI within each group. Finally, an analysis was performed stratified by the degree of preexisting comorbidity. Across the entire hospitalized adult population, adjusting only for the complex survey design, the risk of AKI in patients receiving and not receiving radiocontrast was virtually identical (5.5% versus 5.6%, respectively). Similarly, when controlling for demographic features, mechanical ventilation, and a previously validated combined comorbidity score, contrast use is associated with 7% lower (relative) odds of AKI. Risk was variable based on disease strata. Patients with STEMI had a lower risk of contrast-associated AKI while those with pancreatitis were at higher risk. This may speak to bias selection or other protective measures in certain disease states. There were significant limitations including the identification of AKI via coding instead of clinical factors. Also, they were unable to determine with certainty that the administration of contrast preceded the diagnosis of AKI within any particular hospitalization. Bottom line: Although there are limitations to this complicated study, this large data set of hospitalized patients offers reassurance that the attributable risk of AKI associated with contrast may be lower than previously assumed. Although the risk is somewhat variable between disease states and comorbidities overall, the risk of AKI is no higher in patients receiving contrast than in those not receiving contrast. This meta-analysis and systematic review compared the rates of AKI, renal replacement therapy (RRT), and mortality in adults receiving contrast CT versus those receiving non-contrast CT. The authors searched multiple databases for non-interventional, adult studies assessing renal insufficiency with contrast-enhanced CT and non-contrast CT.
Twenty-six studies were identified that met inclusion/exclusion criteria. Six of the studies were in the ED, seven in ICU patients, and the remainder included multiple or an unspecified setting. Twenty-six evaluated and defined AKI, while 13 measured the need for RRT, and nine measured all-cause mortality. This meta-analysis demonstrated that contrast-enhanced CT was not significantly associated with either acute kidney injury (odds ratio [OR] 0.94; 95% confidence interval [CI] 0.83 to 1.07), need for RRT (OR 0.83; 95% CI 0.59 to 1.16), or all-cause mortality (OR 1.0; 95% CI 0.73 to 1.36). Bottom line: Although limited by the nature of the studies, a meta-analysis of the literature does not show an association between AKI, need for RRT, or all-cause mortality. Although this is relevant to our practice in the ED, it is difficult to interpret this with the heterogeneity and observational nature of the studies. Taken as a whole, these studies would suggest that the risk of kidney injury associated with contrast-enhanced CT is not as high as historical literature would suggest. Even with all the limitations, this data is reassuring that that in populations without other risk-factors for AKI, the benefit of using contrast in select studies likely outweighs the risks. It would also suggest that a randomized trial, once thought to be unethical, can likely be safely undertaken in appropriate populations. This may even better answer questions associated with contrast-associated nephropathy.